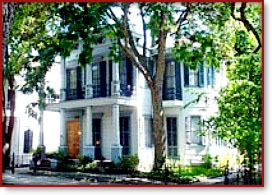 The HH Whitney House is located in New Orleans' Esplanade Ridge historic district, which is situated between the Mississippi River at the Vieux Carré and City Park. We are conveniently located close to most attractions in the historic district and downtown areas, as well as to the Fairgrounds, home of the annual Jazz & Heritage Festival. We are just over one mile from City Park where you may enjoy 300-year old live oaks, the Botanical and Sculpture Gardens, and the New Orleans Museum of Art. The French Quarter, just a half-mile away, is a pleasant 10 minute stroll down the grand Esplanade. Taxi service to and from the Quarter costs $6-7, but you may want to consider using the city's bus and streetcar system with a 24-hour transit pass costing only $3. Remembering that the essence of New Orleans is wrapped up in the experience, why not take the time to discover why New Orleans is the City That Care Forgot? The Esplanade Avenue bus runs about every 30 minutes and offers connections to most other parts of the city. For guests who will be in town 1-3 days and spending most of their time in the historic districts, we do not recommend a rental car, although guests staying longer or wishing to explore swamp and plantation country may find it beneficial. Several tour companies offer packages with transportation to these areas from our front door for between $40-100 per person. The city's vastly different neighborhoods and many places of interest within 1-2 hours drive will capture your attention for days on end. We recommend a minimum of 5 days in order to fully appreciate all that the area has to offer. Taxi service from the airport to any destination in the city costs $36 for 1-2 persons or $16 per head for 3 or more. Taxis are abundant outside of the baggage claim area on the ground floor of the airport. Be sure to give the taxi driver the address and not just the name of the B&B, as there are several hotels and inns about town with "Whitney" in their name. Should you decide to put yourselves in the driver's seat, please follow the appropriate directions below. While online mapping tools like MAPQUEST are good for pinpointing a location, please use our directions which are much simpler and will keep you from getting lost. We are just three blocks north of Interstate 10. When leaving the airport, follow the signs to the Airport Access Road and Interstate 10. Pay close attention because you may have to cross over several lanes of traffic in a short space to take the proper exits. Speed limit on the access road is 35 MPH and is sometimes heavily patrolled. At the end of the access road, stay in your left lane and take the up-ramp to I-10 East. Follow the directions labeled ". . . From the West - via Kenner and Metairie ..." below. Drive into New Orleans on Interstate 10 East through Kenner and Metairie. Remain on I-10 East heading into town -- DO NOT take the I-610 exit at the Jefferson-Orleans Parish line. Continue on I-10 East past the Metairie Road/City Park Avenue and Carrollton Avenue exits. As you approach the Superdome and downtown area, veer to the right and continue on I-10 East towards Slidell. DO NOT take the US 90 Business Route/Mississippi River Bridge approach. Continue on I-10 East past the Poydras Street/Superdome and Orleans Avenue/Vieux Carré exits until you get to exit 236-A at Esplanade Avenue. Take exit 236-A (speed limit on ramp is 30 MPH due to a sharp curve). When you reach the bottom of the ramp, use caution and cross to the left lane. Turn left at the traffic signal at Esplanade Avenue and cross under the interstate. When the signal changes, proceed three full blocks. The HH Whitney House is located in the fourth block on the right at 1923 Esplanade. Drive into New Orleans on Interstate 10 West. From Slidell, cross over the Lake Pontchartrain twin spans and continue through New Orleans East over the high-rise bridge at the Industrial Canal. Remain on I-10 West heading into town -- DO NOT take the I-610 exit. Continue on I-10 West past the Elysian Fields Avenue exit until you get to exit 236-C at St. Bernard Avenue. Take exit 236-C and turn left at the bottom of the ramp onto St. Bernard Avenue. Veer to the right prior to the I-10 overpass in order to turn onto N. Claiborne Avenue which runs underneath and along the side of the interstate. Proceed on N. Claiborne to the next traffic signal (approximately four blocks) at Esplanade Avenue and turn right. Proceed three full blocks. The HH Whitney House is located in the fourth block on the right at 1923 Esplanade. You may park on the avenue in front of the house or you may pull into the driveway. A word of caution, however, when pulling into the driveway: The gate and drive were designed for horse and carriage and are extremely narrow. It helps to swing wide from the avenue into the driveway, but please be cautious of other vehicles and/or bicycle traffic. Traffic behind you may try to pass you on either the left or right and/or may not slow down to allow you to make the turn. Bicyclists use the avenue frequently and are not always easily visible. If you feel uncomfortable pulling into the driveway, please park on the street and upon request, we will be happy to valet park your vehicle. Please remember to keep us informed regarding your estimated arrival time. Although we reside on premises, we are not necessarily staffed 24/7. By keeping us advised of your plans, you can assure that someone will be available to greet you when you arrive. We thank you for your cooperation in this endeavor. If you are arriving at a late-hour, it may be necessary for you to ring the upper bell next door at 1925 Esplanade, where our owners' unit is located. On rare occasions, it may be necessary to leave a lockbox with your key inside that will allow you to gain access to the B&B. We prefer to arrange this ahead of time, but in the event that is not possible, the combination to the lockbox will be your the 3-digit area code of the phone number you provided to us. All guests will be required to register and present photo id at check-in. Any balances due must be paid at that time.